Kris Wilder has been studying the martial arts for over 30 years; beginning his martial arts training in 1976. 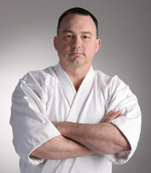 Kris Wilder holds dan grades in Goju-Ryu Karate, Tae Kwon Do and Kodokan Judo. He teaches karate at the West Seattle Karate Academy . He has authored several books on the martial arts including 'The Way of Sanchin Kata: The Application of Power'& 'Lessons from the Dojo Floor'. Along with Lawrence Kane, Kris also co-authored 'The Way to Black Belt: A Comprehensive Guide to Rapid, Rock-Solid Results' and the very popular 'The Way of Kata: A Comprehensive Guide for Deciphering Martial Applications'. This book, on the practical application of traditional kata, won wide acclaim and further cemented Kris's position as one of the 'Big Hitters' of kata bunkai. 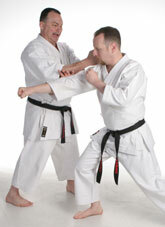 Iain Abernethy has invited Kris over from then USA to teach his approach to kata in the UK for the very first time. Iain interviewed Kris about his martial arts training, his views on practical karate and his plans for his trip to the UK. IAIN: Could you tell us a little about how you got started in the martial arts? KRIS: As a kid I watched the cartoon Johnny Quest and the aide to Dr. Quest was named Race Bannon. Race Bannon was flat out cool - he did Judo while wearing slacks and slip-on shoes. Later on I watched Kung-Fu on television, and then came Bruce Lee, but it really all goes back to Race Bannon. I bought a Judo course out of a comic book and also learned from a book I found at school. The real beginning to my training, though was taking Tae Kwon Do classes starting from when I was 15. I had to pay for the class myself by working around the ranch. We lived about sixty miles from the school, which was in the military armory at the county seat. On Sunday afternoons I would ride my motorcycle through the orchards and fields to my friends' house and his older brother would drive us there. IAIN: What arts have you studied? And who did you study them with? KRIS: Today I certainly consider Goju-Ryu what I do, but I have also trained in kobudo (weapons), Judo, Ed Parker's American Kenpo, wrestling in high school, some Arnis, some Aikido, and some Brazilian Jujitsu. I have a tendency to gravitate to empty-hand arts - just a preference, not a judgment. I want to stress that I am not a collector. I practice Goju-Ryu and Judo; I don't do Tae Kwon Do as a discipline anymore. However, I really like to experience what others have to offer. I trained with Kenji Yamada in Judo and in Karate under the Sho Rei Shobu Kan organization of John Roseberry, a student of Toguchi. I am now under the tutelage of Hiroo Ito. The list goes on to include many, many others. Everybody I have had the opportunity to train with teaches me something. I really make an effort to be open, and to listen well. IAIN: Have you found that studying other arts has helped you with your core art of Karate? If so, how has that study helped? KRIS: Oh, yes, absolutely other systems have helped me immensely. I use other styles and arts as light that I shoot through the prism of my art to illuminate aspects that I may not have observed. However, I would caution that a person should never think they are going to go around and amass an arsenal of brilliant techniques and be ahead of the game, because it doesn't work that way. This type of "technique hunting" behavior is as useless as a wheel without a hub. Find one art that resonates with you and then go deep into that art. 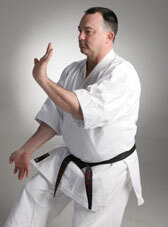 IAIN: Your book "The Way of Kata" is a very popular handbook on the practical application of kata. What made you decide to write a book on that subject? KRIS: One day in conversation Lawrence Kane said, "Hey, you should write a book on this stuff you teach." At that time we each had a book on martial arts out on the market, but, as I am not a very confident writer, what he pitched seemed daunting. So I said, "Let's do it together,", and we did. It was really that simple. Lawrence and I compliment each other very well; we play to each other's strengths and get on really well; we socialize outside the dojo and our boys are the same age. One of my students, Laura Vanderpool, has helped us greatly too. We would be lost without her keen eye for the English language; she has touched almost every work we have done. IAIN: Do you truly believe that the methodology of kata adequately addresses the needs of civilian self-protection? KRIS: Yes, without question. In this regard, there are essentially three roles that a person might play: Civilians , which are to escape danger; Police , which stop danger; and the Military , which kills the danger. Most people are civilians; and Kata is about the civilian role of existence. We need to make the danger stop and then escape, escape being primary. Kata teaches to fight, to cheat, and to not lose. And finally because karate is primarily a standing art, you keep your feet so you can run away. If the situation truly dictates that you cannot escape and you will have to fight, you must cheat, be swift, and not lose. Kata gives you those skills. IAIN: What would you say to those who would point to the fact that in kata there is no live opponent? KRIS: When you see a western boxer in the ring, and I am a fan of boxing, you are seeing the proverbial tip of the iceberg. They have spent countless hours doing early morning running, heavy bag, jump rope, sit-ups, and studying their opponent. Not one of those things involves actually hitting another person. American football players use red jerseys for quarterbacks during practice so they don't get hit; they also have "no pad" practices as well. Every sport or martial art has their means of preparation and training that develops skills without the hard contact because to do otherwise, to train by fighting all the time, would wear the body down. If you put kata in that context it makes kata's place in training more understandable. It is a means of training and communicating knowledge. I love the idea that I get to explore a long-dead person's fighting technique via their kata. IAIN: Accepting that you've written a whole book on this subject, what do you feel are some of the key things karateka need to do or be aware of in order to make their study of kata realistic and relevant to actual combat? KRIS: Violence happens faster, closer and harder than you think. Part of the human condition is that we have a great capacity to over-predict an event and then under-prepare for the very event. We do it in our daily lives and we do it as nations. Over prediction produces worry, and being under prepared makes trauma. I am not keen on either. Knowing this can help shape your training; it helps focus goals and direction. A second point is about elaborate structures. They don't have sustainability when it comes to fighting; a simple movement is best. So I suggest that a person always seek the most unadorned movement and then give it a good dusting of cleverness. Keep it simple, be direct, and be clever. IAIN: You also wrote a very in-depth book on Sanchin kata. Why did you choose to write a book on Sanchin? KRIS: Sanchin is like rain and the kata are like the trees. Sanchin is essential to the Naha-Te schools of Karate as Nihanchin (Tekki) is to the Shuri schools. I wrote The Way of Sanchin: The Application of Power because I thought people could use it to make their art better. That is my hope for the book, that people enjoy it and they get something from it, I especially like it when somebody says, "I learned that from my Sensei, but I just never heard it explained that way before." Those kinds of comments tell me that we both (my book and their teacher) are converging on truth; you could call theses experiences proof points. IAIN: You are due to teach your first seminar in the UK soon. In addition to kata bunkai, are these the kind of things you wish to cover over the weekend? KRIS: What people will learn are strategies of alignment, power, and swiftness; not just a tool box full of techniques they can go home with and sort out, but things that will make their primary art stronger, faster, and better. Conversion is not my agenda; exploration of what you already have is the route I prefer to follow. People have made choices in the art they study, so my goal is to support their choice, not change it. This goal is the mark of success for the seminars I teach. We are going to spend the first day on alignment and muscles using drills to test our success and understanding. The next day is about working out some techniques using this alignment and bringing these attributes back to kata. The result should be that people's kata will then be different in tone and their fighting, too, will change for the better. IAIN: You're also a dan grade in Judo. Do you see Judo as being a practical martial art? KRIS: Just about any sport can become a martial art if a certain line is crossed. And Judo being a martial art in its primary form can cross the line to practical in the blink of an eye. News stories pop up now and then about some Judoka stopping a crime or some sort once or twice a year. I recall one in the States where a guy tried to carjack a van a gas station; the van was a Judo team bus, and it didn't go well for him. Flight 93 that went down over Pennsylvania on 911 had its flight deck charged by Jeremy Glick, a state Judo champion, along with others, and from my own experience the answer is yes, Judo has great relevance as a martial art. The stories just go on and on. One of the beautiful things about Judo that doesn't exist in karate is when you hit the mat it is known in a very short time what you have and what you don't have. You can talk with someone for hours about life and such, but you will know more about their spirit by rolling with them for five minutes. IAIN: Tell us a little about "The Martial Minute"? KRIS: The Martial Minute it is a pretty simple straight up news letter that takes all of about a minute to read. Then if you want to you can explore an attached link or two. I try to keep the tone light and little fun. I run the entire thing from the content to the list management, I like the personal touch. In keeping with that personal tone I try to answer every e-mail myself and never ever sell or loan the list. In today's world I think people appreciate the personal touch. IAIN: What is your own current training regimen? KRIS: Oh, I do silly things, like I have a weight vest that I wear when I walk up to my son's school for lunch break, I use my hands and fists to bounce off the dojo walls to train my back. Some times I do kata very slowly in an effort to audit my balance. I work Kettle Bells, Chishii, (stone levers) and Makiwara. I have a twenty-five-pound sack of sand we throw around the dojo; catching and throwing it is awkward. Some sit-ups, push-ups, stretching to prevent injury, Ne waza (ground work), Uchi komi (fitting in drill), I stand in what we call "Big Tree", jump some rope. I sit in Seiza almost daily to meditate and practice my breath control, but I don't have a prescribed time or amount of time I follow. I also do Sanchin kata regularly, and often join in doing the same drills I am teaching in class, whatever it might be. I don't train with anywhere near the same intensity that I did when I was competing in Judo, not even close. I like to feel a little sore; it tells me I'm working, but the days of having my toes hurt so badly that not even my bed sheets could touch them, that is gone. IAIN: I know you've taught alongside leading reality based practitioners such as Rory Miller. Do you see any contradiction between the traditional arts and modern reality based systems? KRIS: At the level of reality, no, there is no difference, because the violence decides your response and your training is all you can control. Your training will work or not. That might seem like a flip answer but it is true. Reality is just that - reality - and you can choose to ignore it or see it, but it is what it is. I asked Dr. Jeff Cooper, an emergency room doctor and martial artist, if he had ever seen somebody hurt badly and recognized that the perpetrator had real skills. He said no, that it all looks the same, whoever did it - violence looks like violence. I think that is the bottom line. Tactically there are things that are taught in some traditional martial arts schools that I don't agree with because they are not in agreement with the fundamentals of violence. And frankly some of the techniques are laughable - not the people who earnestly pursue these techniques - but the propagation of these techniques, well, they are not relevant to real violence. Within the context of the question, Karate is about violence, short, fast violence, and escape. IAIN: What are you hoping to achieve when you visit the UK? KRIS: First, making some new friends. I really enjoy people and in particular, martial artists. I have learned some wonderful things from martial artists, and have had the chance to share some of my ideas. I just enjoy the human experience and the joy of the martial arts is found in a tie that binds us. Martial artists are a unique group of people - we have been places outside and inside ourselves that many people never touch, and that exploration of self is a common ground that knows no border. Finally, I hope to teach successfully, be challenged, roll, fall, hit, be hit and laugh a lot, and eat some real Fish and Chips.